« Did You Own A Pair Of Leg Warmers? 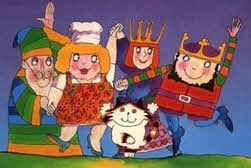 King Rollo was an animation created by David McKee, who was also creator of the much loved (by me, anyway) Mr. Benn. The series was about the titular King Rollo, who though he appeared quite grown up (he even had a beard!) he was actually quite child like in nature, playing with toys and, to be frank, being told what to do by his cook and his magician. So it was he spent most of his time learning about the world, ably assisted by his cat Hamlet, who also appeared to be more grown up and worldly wise than his master. When King Rollo got bored playing by himself he had his next door neighbour Queen Gwen (two castles next door to each other, what a street that must be to live in!) to play with and also fellow King Frank. The characters in the cartoon did not speak. Instead it was down to narrator Ray Brooks (who also narrated Mr. Benn as it happens) to do all the talking. As I recall he did change the sound of his voice slightly when one of the characters was supposed to be saying something, but it was more a change of inflection rather than a put on accent or something. The animation was fairly simple in nature and was of that approach that looked like it was done with arms and legs being cut out from pieces of paper (although somehow it wasn’t quite to the extent of, say, Pigeon Street or Crystal Tipps), although this suited the art style perfectly as that was fairly simple looking too. The character of King Rollo first appeared in books in 1979, but the cartoon followed in 1980 with 13 episodes being made by King Rollo Films, a company which was set up by David McKee and has since gone on to win several awards, including two BAFTAs for their adaptation of another book character, Maisy Mouse. This entry is filed under TV - Cartoons	and was posted on August 9th, 2010. You can follow any responses to this entry through the RSS 2.0 feed. You can leave a response, or trackback from your own site. I loved King Rollo! Although his cat used to scare me a bit, but King Rollo [as well a Pigeon Street] was the best thing on TV!